Automation trends such as improvements in materials science, the application of AI and IoT, and developing regional hubs will continue to grow the robotics industry, said panelists at PTC LiveWorx’s robotics track. BOSTON — Last week, thousands of people attended LiveWorx here to learn about developing technologies including additive manufacturing, smart cities, and the Internet of Things. PTC teamed up with Robo Business Media, the parent of Robotics Business Review and Robotics Trends, for the event’s first-ever track on automation trends. In the robotics track, experts and attendees discussed social robotics and “emotional” artificial intelligence, healthcare automation, smart manufacturing, and more. It’s clear that robotics, AI, the cloud, and IoT are already transforming multiple industries. Here are some initial automation trends takeaways from the event. The division between robotics research conducted by universities and that done by private companies often keeps technologies from advancing or being shared with potential users. Researchers at universities and laboratories will either work on basic science or have difficulty finding markets for new robots or AI. On the other side, robotics suppliers may be missing opportunities to test their products or develop them further. Examples of cooperation do exist in places like New England, Silicon Valley, or Pittsburgh, where robotics clusters exist. Universities such as the Massachusetts Institute of Technology, Stanford, and Carnegie Mellon have spun off many robotics and AI startups, inspiring others worldwide. As companies are born and form partnerships with more established players and customers, these clusters have attracted more talent, speeding up local automation trends. Vause discussed how these new grippers can be used in a variety of applications such as fruit packing, where traditional grippers struggle with both picking up the fruit and doing so without damage to it. Robert MacCurdy, a postdoctoral associate at MIT’s Computer Science and Artificial Intelligence Laboratory (CSAIL), also discussed breakthroughs he has made in materials science. He has successfully created robots in a process that 3D prints both solid and liquid materials into bellows-like structures that enable them to move. MacCurdy is also doing further research into modules that could be used to build entire robots in an automated fashion. These modules, which he said should be “really simple, really small, and really cheap,” could revolutionize robot assembly because they could be 3D printed or assembled by other robots. The drone industry is showing no signs of slowing down. Although unmanned aerial vehicles (UAVs) are best known for aerial imaging, they are quickly becoming versatile platforms that can hold a wide variety of equipment. By 2020, drones are expected to become an $80 billion market, which reflects the increase in tasks they can perform, particularly when they feed data to IoT and AI systems. One example is the Persistent Aerial Reconnaissance and Communications (PARC) drone from CyPhy Works Inc. in Danvers, Mass. PARC runs on a tether, which grants it nearly limitless flight time and reliable communication links. CyPhy Works CTO Helen Greiner explains tethered drone advances at LiveWorx. Helen Greiner, co-founder of iRobot and chief technology officer of CyPhy Works, explained at LiveWorx that the drone can carry a variety of cameras, as well as radio and communication payloads such as cellular signal repeaters. Combined with complete weather sealing and its ability to fly through snowstorms and other adverse weather, PARC can fulfill a variety of roles such as surveillance and security. In fact, PARC has been deployed for the Tokyo and Boston Marathons, noted Greiner. The drones could also help boost wireless bandwidth at festivals or in emergency situations. CyPhy Works is also working on mobile drones mounted on trucks and delivery robots that wouldn’t be tethered. As robotics, AI, and IoT continue to develop, the automation trend will expand to even more end-use cases, said LiveWorx panelists. “Anything manufactured, moved, or managed will likely be done through robotics,” stated Daniel Theobald, chief innovation officer at Cambridge, Mass.-based Vecna Technologies Inc. and co-founder of MassRobotics. That statement is bound to scare many people already fearing an oncoming jobs crisis, as robots are designed to perform ever more complex tasks. Even industrial automation has undergone a substantial change in recent years. “Flexibility is the new productivity,” said ABI Research’s Dan Kara. In the future, industrial robots will become “intelligent automation” as they gain the ability to learn rather than just be programmed, said Kara. However, machine learning and IoT bring an enormous need for skilled programmers. Kara gave the example of teaching robots to grasp and manipulate objects of different shapes and sizes for pick-and-place operations. This feature is already difficult to code into robots, and enabling them to remember how to handle different items creates even more challenges. There’s little doubt that automation trends will replace jobs in assembly lines, warehouses, and elsewhere, but it’s equally certain that the demand for programmers of these robots will continue to skyrocket as their complexity and flexibility increases, Kara said. While the robotics industry continues to experience rapid growth, it has yet to fully mature, said the panelists in LiveWorx’s Robotics Track. The industry is still very fractured, with the majority of companies being small startups focusing on only a few robot designs or a single software project. 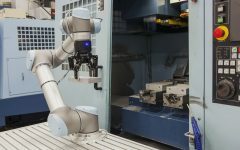 Because of the lack of vertical integration and the lack of a strong business model standing behind their products, robotics suppliers have often struggled to reach their full potential. Robots will affect jobs and businesses, but it’s possible to responsibly manage the transformation, says Vecna Chief Innovation Officer Daniel Theobald. Vecna’s Theobald also talked about the need for robotics companies to have structure. He co-founded the MassRobotics organization to offer local companies networking services and resources such as shared research space. Significant funding for robotics companies and research is often available from both public and private sources, noted Stebbins. The problem is that most companies don’t know where to look, she said. Many states, especially those with existing robotics clusters, are eager to invest in the industry and have set aside public funds for robotics, Stebbins said. As the robotics industry matures and consolidates, organizational difficulties, funding challenges, and market fragmentation will start to fade, the panelists said. Business leaders can address these automation trends through internal collaboration, partnerships, or securing investment from eager sources. Why Will 5G Disrupt Robotics, Manufacturing Industries? Massachusetts has been rated as the top state in the country on the Milken Institute State Technology and Science Index for the past 14 years. For those watching automation trends, this should come as no surprise. The state is home to some of the top university robotics programs in the U.S., including those at MIT, Worcester Polytechnic Institute (WPI), and Harvard University. Furthermore, it’s home to more than 150 robotics companies, which employ over 4,700 people, said Stebbins.